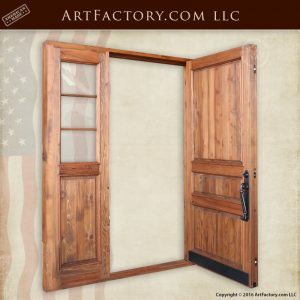 At Artfactory.com, our custom 3 panel front door wood doors is handmade in the USA from all natural, solid wood. This custom entrance, as pictured, includes a custom hand forged wrought iron door pull, and thick dual pane glass sidelights. Like all of our wood products, it has been hand hewn with mortise and tenon joinery. This type of craftsmanship means that your custom doors are built to stand the test of time. This custom 3 panel front door also features 3 panel sidelights on the upper have of either side of the door, and a solid wood panel on each side below the sidelights. All of our sidelights, transoms, and custom windows are are built with thick, dual pane glass. 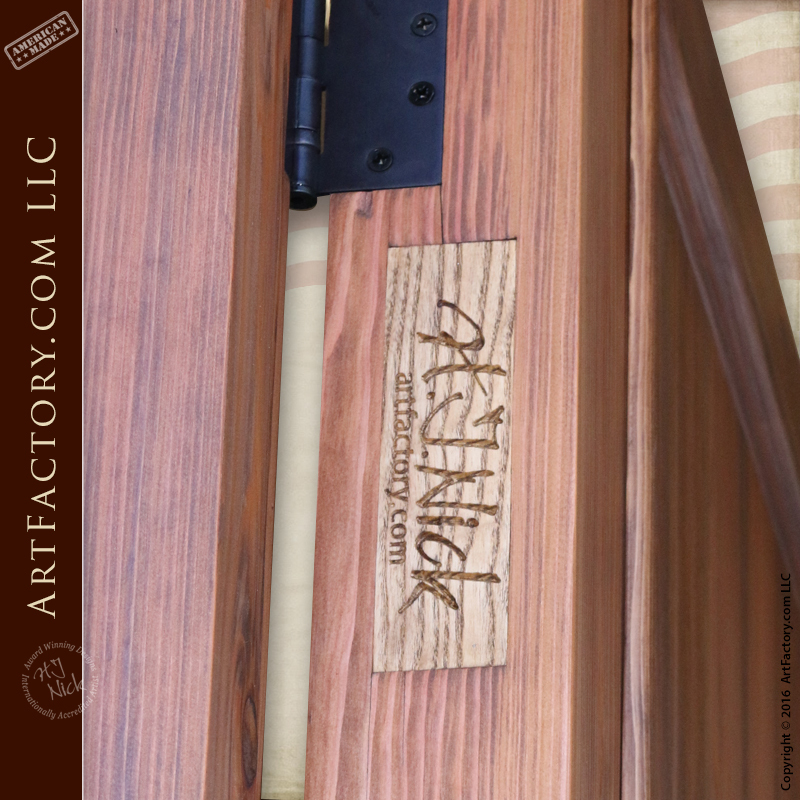 The custom 3 panel front door, and all of our handmade doors feature a hand rubbed with a wood finish. We have hundreds of stain colors to choose from, or we can match to an existing sample. These wood finishes are hand applied by master craftsmen using a multi-step process that blends the finish into the grain of the wood. This makes for a finish that won't fade, flake, or crack like painted or powder coated finishes. Our doors are sold as a complete package. This means that we include fully customizable, wrought iron hardware with each door. All of our hardware products hand forged by master blacksmiths. When we say hand forged, we mean hand hammered over a coal fired forge. Additionally, all hardware products are made from pure, solid wrought iron. We use wrought iron because unlike other metals, wrought iron doesn't corrode with exposure to the elements. Furthermore, all of our hardware products are advance patinated using a hand applied, heat infused process that bonds the iron oxide patina to the metal at over 1000 degrees Fahrenheit. This process makes for a finish that will stand the test of time with little or no maintenance. The custom 3 panel front door as pictured, features our popular custom spiral door pull. You can choose from any of our many styles of twist door pulls, or any of the other custom door handles or theme door pulls that we offer. You can even send us a picture, sketch, or have one of our engineers design one for you. When it comes to custom door pulls, your options are unlimited regardless of what style of door that you choose. All of our custom doors are made in the USA by master craftsmen, just as they have been since 1913. 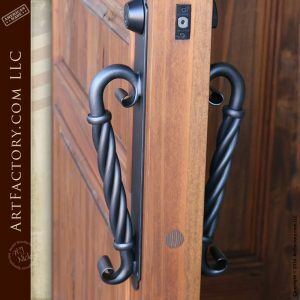 These are unique, fine art quality products that are made with the finest grade materials, and handmade master craftsmanship. Furthermore, every product that is built in our world class factory is built under the supervision of award winning artist H.J. Nick. Each product is inspected by, and signed and certified as meeting all world class fine art specifications by H.J. Nick. This guarantees that you will own an investment quality custom door that will have future appreciable heirloom and antiquity value. 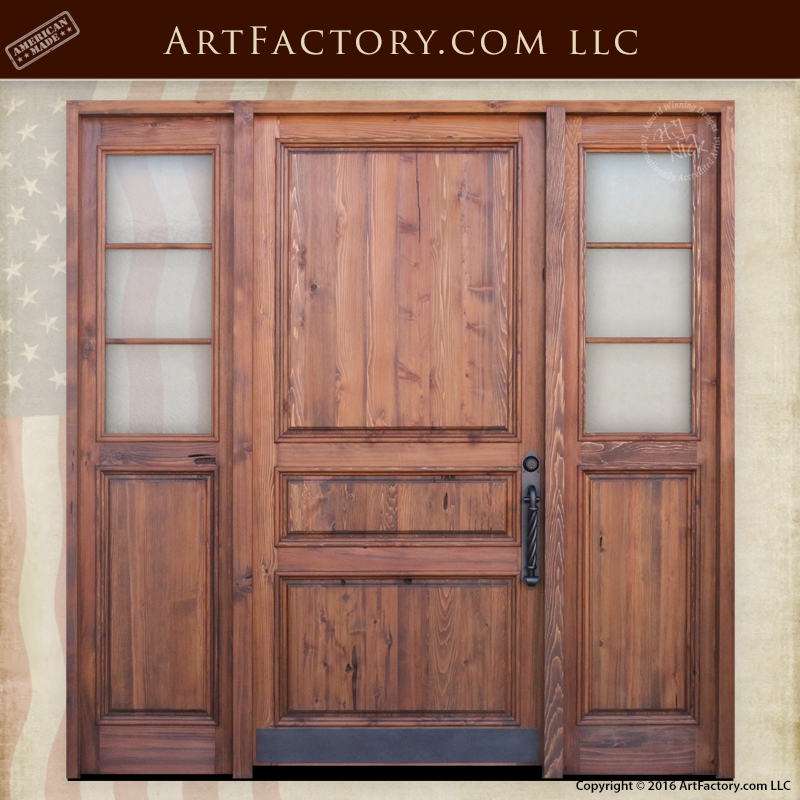 We specialize in building historically inspired door designs using the same methods and materials that were used to build the original doors in the old world. It is our belief that using the correct tools and building techniques is especially relevant when creating a piece inspired by history. It is this kind of attention to detail that makes the difference between a low quality reproduction, and a product that stands on its own as a piece of unique fine art. When nothing but the best will do, call ArtFactory.com for a custom quote today at 1-800-292-0008. We are so confident in the quality of our products and craftsmanship that we guarantee everything forever.